The powerful core of your electrical supply at home or office lies with your electrical panel – an advanced system that takes care of distribution, regulation and fail-safes. Electrical panels are now ubiquitous in homes and offices in Texas, where they do most of the heavy lifting that goes on to provide you with the perfect power in every room. Electrical panels, like other devices, can develop snags over time. Parts can become worn out or entire units can develop faults. There might also be situations when you need your entire panel to be replaced by a more modern, efficient one. For all these requirements, we at GPE Electrical Services has the perfect solution – our stellar electrical panel servicing option. If you are experiencing electrical panel issues at your residential property or in office in Texas, we are the right people to help you out ironing out the problems. Our team has years of experience sorting out different kinds of electrical panels, the requisite skill set and the important tools to ensure the smooth accomplishment of the job. At GPE Electrical Services, we pride ourselves on the standards of electrical services and solutions we provide. 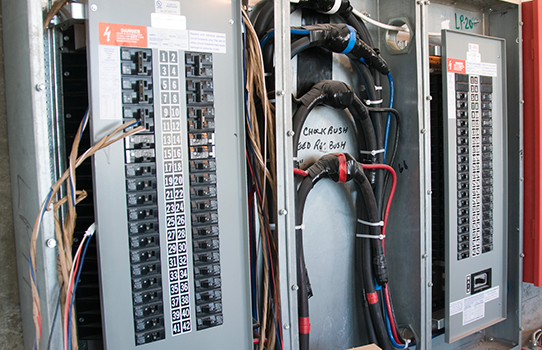 Our teams know the ins and outs of electrical panels thoroughly, and are equipped with advanced testing equipment which allows them to diagnose these panels in a matter of minutes. Once we have the problems identified, we can go ahead with a complete servicing of your electrical panel and restore its operation to the standards of optimum performance that you require. With us handling your electrical panel servicing, you can have the peace of mind that you need, knowing always that your panels are performing as per standards. We ensure that you enjoy consistent, reliable electric supply at home or office without facing snags and problems, while also taking every measure possible to ensure the complete safety of your family and your employees. No matter how big or small your system is, with us at your corner it is always in good hands. Our servicing plans are competitively prices and come with a guarantee of full satisfaction. All you need to do it get in touch with us at GPE Electrical Services and we would take care of your electrical panels in Texas the right way. Contact us for more information on servicing plan and options and choose the one that suits you best.